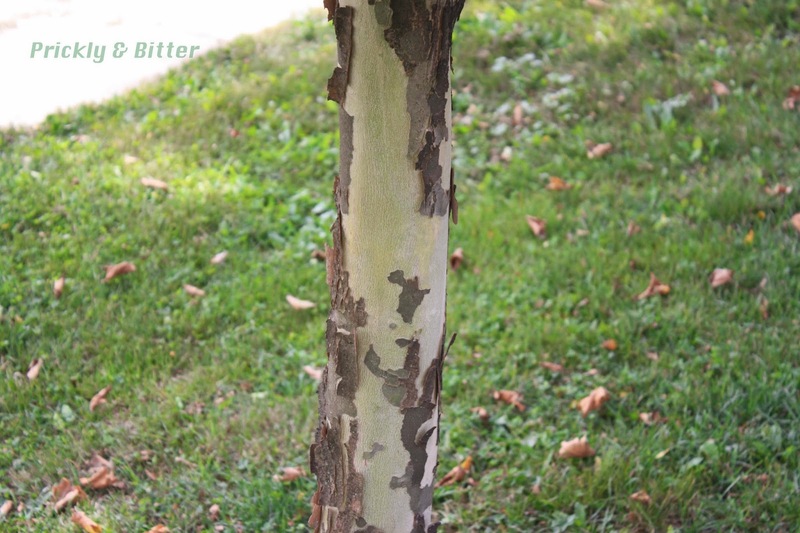 The planetree is a hybrid, which makes its native range essentially a moot point. But for the purpose of a species status diagram, it's a non-native species since the hybrid is rumoured to have been first discovered in Spain in the 1700s, but was first officially described by a Scot in 1789 as a variety of the Oriental sycamore, or Platanus orientalis. It was elevated to the status of species in 1805 by Willdenow (Platanus acerifolia), but it is now widely believed to be a hybrid of the American sycamore and the Oriental sycamore (sometimes called the Chinese sycamore or even the Oriental plane). It looks like an exact intermediary of the two species: has leaves with lobes not nearly as shallow as the American sycamore but more shallow than the Chinese sycamore, fruits in pairs instead of singly like the American sycamore (the Chinese sycamore usually has 3-6 fruits in a group), and light green inner bark unlike the white bark of the American sycamore and the much darker green bark of the Chinese sycamore. I love it when hybrids are a 50/50 blend of the parent species! It makes life so easy. So why would you want to plant a hybrid species, when the American sycamore is a native species and looks pretty darn similar? 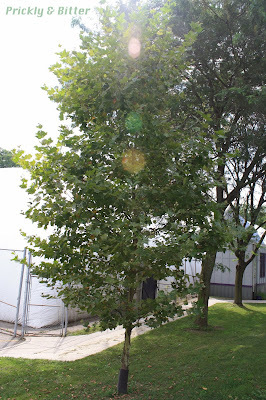 Well, for one, the planetree is much more tolerant of urban conditions like pollution and root compaction, as well as being much more drought-tolerant and so doesn't require the riparian habitat that the American sycamore does. It also doesn't get nearly as large, which is often beneficial in cities (you don't exactly want a 5 meter in circumference tree growing between a sidewalk and a road). 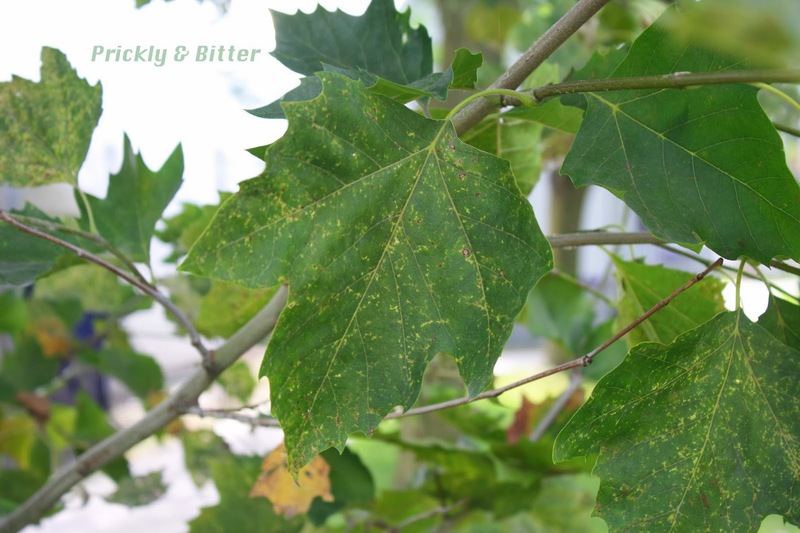 It is also much, much less susceptible to a fungal disease called anthracnose, which is quite common in American sycamores. So far it sounds like a pretty good compromise! Unfortunately, all good things must come to an end. The planetree actually has a really nasty side to it in the spring: it is highly allergenic. The new growth of the tree produces tiny hairs on the surface of the leaves, the leaf buds, the branches, and the fruits. As the tree sheds these hairs while it matures, they blow off in the air and (usually) end up up your nose. Here, they attach to just about anything they can get ahold of, and trigger a severe immune response (this isn't just your typical pollen-allergy runny nose). Some people have even reported a skin response that looks like a second-degree burn as a result of coming into contact with many of these hairs (say, for example, grabbing onto a young branch in the spring) and the resulting rash is a hyper-immune response. This effect tends to decrease as the tree ages, but if you plant a young tree, be warned. Now that I know this, you won't catch me coming anywhere near one of these trees in the spring. I have really sensitive skin, and with my luck I'd be the one that ends up with giant pustules all over my hands and arms! The leaves are also difficult to deal with in urban settings as the leaves produced on mature branches are very thick and leathery. If left to rest where they fall, they can take years to start to decompose (unlike a few months like most leaves, which is why they make great compost starters and mulch). This means they are problematic to deal with in the fall clean-up to prepare streets for winter. Planetrees are sometimes planted for lumber and logging purposes because of the very attractive wood (it's a light yellow wood with red flecks). In the lumber industry it's often referred to as Lacewood, and is used in wood trim or decorative panels in fine furniture.